Henry Purcell (10 September 1659 (?) – 21 November 1695), was an English organist and Baroque composer of secular and sacred music. Although Purcell incorporated Italian and French stylistic elements into his compositions, his legacy was a uniquely English form of Baroque music. 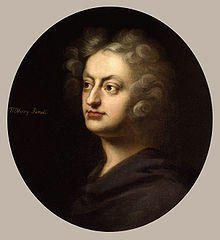 After his death, Purcell was honoured by many of his contemporaries, including his old friend John Blow, who wrote "An Ode, on the Death of Mr. Henry Purcell (Mark how the lark and linnet sing)" with text by his old collaborator, John Dryden. More recently, the English poet Gerard Manley Hopkins wrote a famous sonnet entitled simply "Henry Purcell", with a headnote reading: "The poet wishes well to the divine genius of Purcell and praises him that, whereas other musicians have given utterance to the moods of man's mind, he has, beyond that, uttered in notes the very make and species of man as created both in him and in all men generally." Purcell also had a strong influence on the composers of the English musical renaissance of the early twentieth century, most notably Benjamin Britten, who created and performed a realisation of Dido and Aeneas and whose The Young Person's Guide to the Orchestra is based on a theme from Purcell's Abdelazar. Stylistically, the aria "I know a bank" from Britten's opera A Midsummer Night's Dream is clearly inspired by Purcell's aria "Sweeter than Roses", which Purcell originally wrote as part of incidental music to Richard Norton's Pausanias, the Betrayer of His Country. Click here to view all items related to Henry Purcell.